“As the talent war has intensified, more human resources managers have turned to recruiters, but with so many staffing agencies to choose from, how can companies know which are best suited to their searches?’ asks Forbes Staff Writer, Vicky Valet. The answer is Abacus Group! 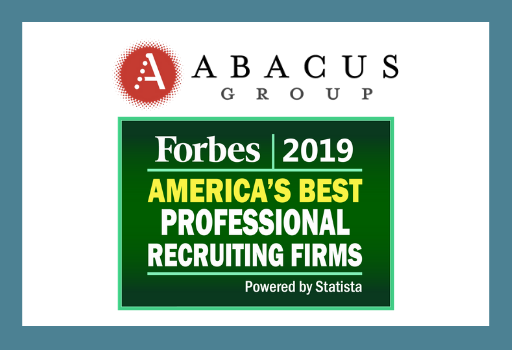 Yesterday, it was announced that Abacus Group has been placed on the 2019 list of Forbes’ America’s Best Professional Recruiting Firms. This is the third year in a row that Abacus Group has been distinguished with this award. Each year, Forbes partners with market research firm Statista to find the winners. “To determine the list, Statista surveyed 25,000 recruiters and 5,000 job candidates and human resources managers who had worked with recruitment agencies over the last three years,” said Vicky Valet. Brian Bereck and Len Frankel, Founding Partners of Abacus Group, are exceptionally proud of their recruiters and staff members for continuing to build the firm’s great reputation. This award comes only a month after the agency’s sixth-consecutive Best of Staffing® recognition. Clearly Rated’s Best of Staffing® honors fewer than two percent of firms in the industry for superior client and talent services. All of us at Abacus Group are so proud to have earned this recognition, but these awards pale in comparison to the excitement we experience when we call a candidate to share that a client has offered them a job! Our relationships with our candidates and clients are what make our jobs so wonderful.